I just love the Brocade Backgrounds DS Paper - it coordinates so well with the Baroque Motifs set. Shown here is a 3x3 box (the box is in the center - Olive Card Stock) that I created to hold my 3x3 coordinating cards and envelopes. This little box and cards makes a great gift set. 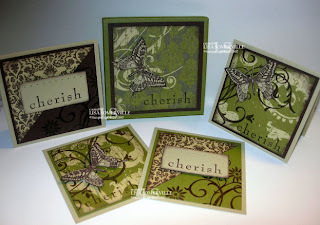 These are beautiful cards - this paper is some of my favorite too! TFS! Awesome cards Lisa. I just love that chocolate one!! You have been a very busy lady I see! Great work! box? I don't see the box, just cards, am I blind again?? The cards are beautiful. With this format, do you make your own envelopes or are they commercially available? Those are a stunning combo! Great gift for sure!! You are the queen of Baroque! Truthfully, no-one does this set like you. Just gorgeous! All hail the Baroque Queen, someone has a new title to defend at the CAPE! These cards are simply gorgeous!!! And Spendiferous at the same time! Hail to the queen!!! Lovely!I can't wait to make another one!! TY!! for the inspiration! !